Dig This! 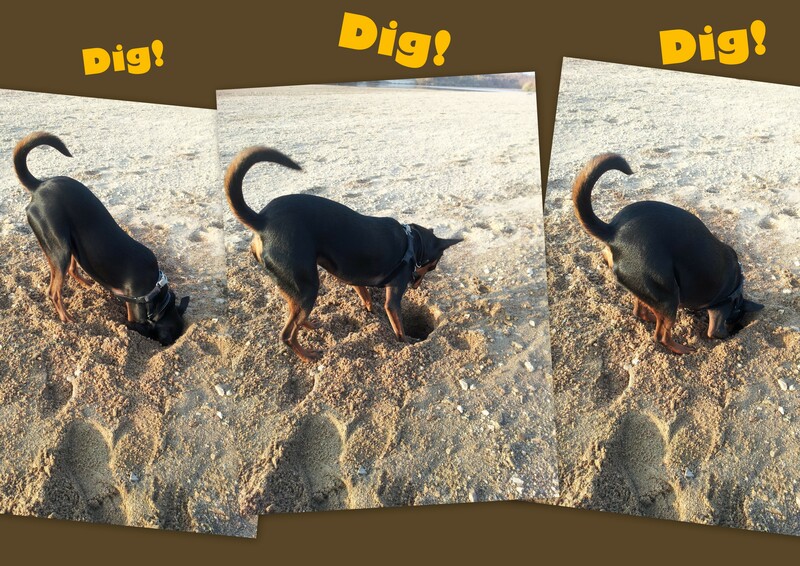 Digging Holes~~ | I Heart Webby! Webby LOVES to dig holes—I saw her try a few times in the dirt around our apartment building, but it’s pretty hard-packed and she never managed more than an inch or two (and as a considerate neighbor, I always made sure to fill the hole back in). 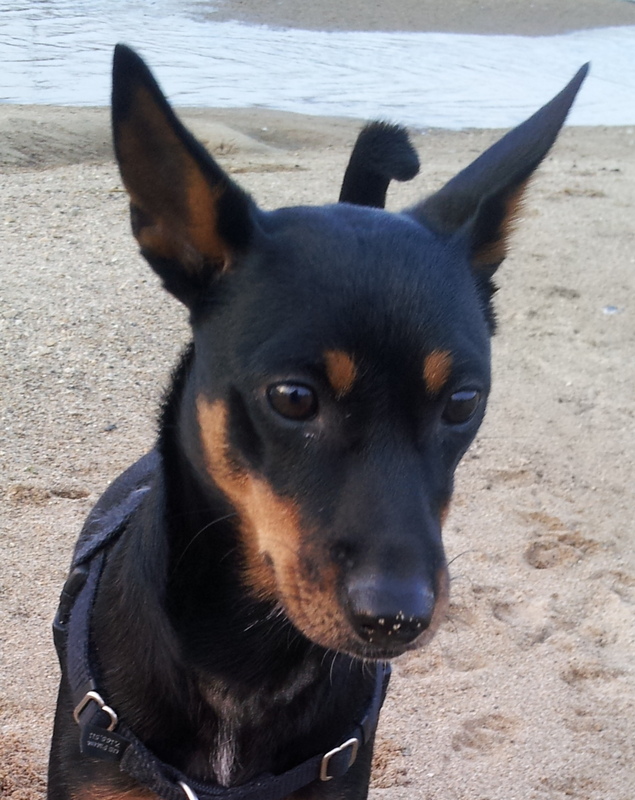 But then we started hanging out at the sandy riverbank in Icheon, and she has fallen in love with digging in the sand. 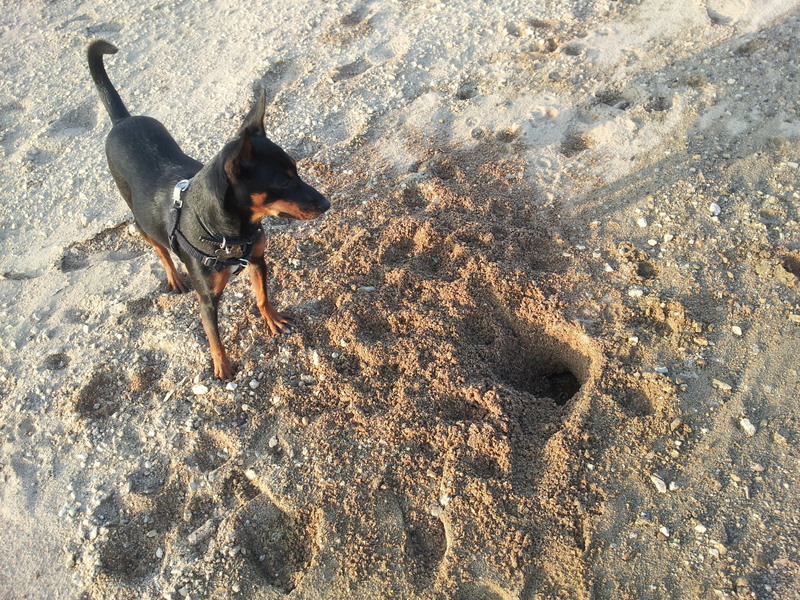 I can’t blame her: she’s able to dig pretty deep and the sand makes an entertaining shwish shwish sound as she paws through it. Sometimes she’ll get so excited that she’ll take a break from the digging to frolick around a bit before returning to the digging. The only downside is that with her long pointy nose, she sometimes gets sand stuck to her nose, and even occasionally inhales a few grains…and then my poor girl is snorting up a storm until her nasal passages are clear again, but this hasn’t hampered her enthusiasm for sand one bit! In the following two video clips, you can see her having a field day! In the second video, she manages to dig up a weed that she plays around with a bit before realizing it’s NOT tasty! Now, I happen to think that Webby’s digging is a super cute habit, but I can see how it could be a problem when Webby stays with my parents for a year while I attend grad school in the US. They have a lovely, and large, backyard that I plan to keep safe from Webby’s love for digging. Here’s a link that I found helpful about creating a special “digging pit” for my dog, if necessary. We’ll see what happens this spring when we head over to California! Posted by mz jenny lee on April 5, 2013 in Uncategorized and tagged digging, digging pit, dog, holes, riverbank, sand, Webby.